for cleaner and more engaging social media content 1. Shoot landscape! Just do it. It looks more professional (because all professional HD films are 16:9 as well, plus Instagram excepts 16:9 now!). 2. Notice your stance. Like yoga. The steadier the shot, the better. You can make a smoother video getting grounded with your feet hip-width (or wider) apart and knees slightly bent, belly in, the energy of your shoulders/arms/elbows moving toward the ground and a nice easy but firm grip on the phone with two hands. Shoot from your core instead of from your arms! 3. Avoid walking while shooting. At least try. If you want some movement of the frame try taking a wide stance with your feet and moving your center (not just your arms!) from left to right (or right to left) as if you yourself are a track or tripod for smooth camera movement. 4. Pick a good setting/background/lighting. It really counts. Try to avoid shooting into the sun (unless you are going for the backlit look of course). Instead, try shooting where the light naturally falls onto your subject with the least amount of shadows as possible, otherwise the camera will be doing that auto-exposure adjustment thing while you are shooting that immediately gives it a phone video look (what we are trying to minimize). Light your subjects if you can. Outside almost always looks better than inside, so shoot outdoors (during the day) or near a studio window (with the natural light falling on the subject) when possible! 5. Consider your audio situation. It matters. Most people forget or don't realize how effective audio is to video (just try watching any video or film that moves you and turning off the audio, it doesn't have the same hit does it?). If you're outside and it's windy, choose a more wind-protected spot. If you're in the studio, have folks be quiet if there is talking and maybe don't stand right next to the speaker. And as the camera person, be quiet and slow moving yourself. ...for awesomely smooth camera movement. This one is more expensive, but it is THE BEST steadicam for small camera devices. If you plan on crafting lots of performance video content for self-promotion on social media, this tool I highly recommend. Happy phone video making and posting! Firstly, if you don't have a Vimeo account, we highly recommend it! 1. If your performance work includes music that you don't have the rights to, your work samples and videos will get kicked off of Youtube or if you upload it directly to Facebook. However, Vimeo has an excellent Fair Use policy in which this will not be an issue. We have been encouraging our clients to upgrade their Vimeo accounts (to at least Vimeo Plus) so we can upload all of their HD videos to their own accounts as well as for downloadability. This is the nature of all of these online services - you get enough people dependent on the service, then you limit the free version and create paying subscribers. It's to be expected. Thankfully for now the Vimeo Plus and Pro accounts have reasonable annual fees only. That said, we offer to house any videos produced or edited by LRP on LRP's Vimeo account indefinitely, so if the annual fee is an issue, we've got you covered! 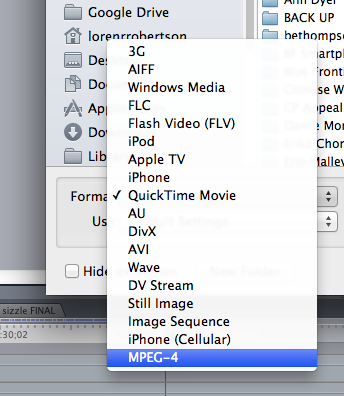 2. in the Export box, choose "Movie to MPEG-4"
5. 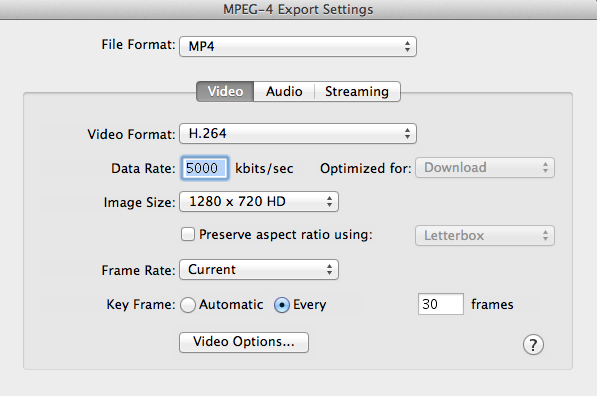 For Video Format, choose "H.264"
8. 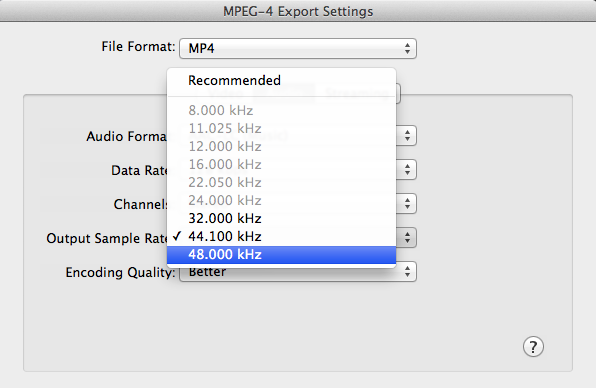 For Frame Rate, choose "Current"
11. Leave other Audio and Streaming settings as and Click OK. Your HD Web Video will begin being created. When it's complete, upload to the Web*! There are other factors to ensuring highest quality, for example proper sequence settings in your editing software and proper import of the source footage and of course, acquiring the original HD footage from your videographer. If all this makes your eyes glaze over or your heart race, you can always consider having a professional complete your video post-production needs. Feel free to reach out for a quote - we'd be happy to help! 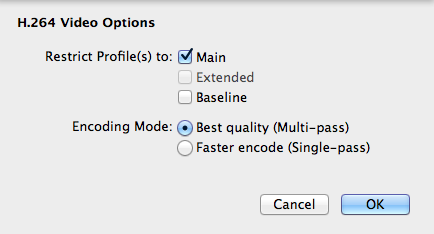 *Vimeo does have upload limits, but don't make your video files smaller or you will seriously compromise the quality. We recommend upgrading to Vimeo Plus or Pro if you are uploading regular content. We would also be happy to house any videos we edit for you on LRP's Vimeo account password protected, indefinitely. 2. A "Save" box opens, under "Format" choose "MPEG-4"
* This is the number that you will need to adjust to get the file size you want. Say you are uploading two 5min excerpts and are given a limit of 250MB total. That means they each will need to be under 125MB (totaling 250MB). After you enter this info but before saving, look at the bottom and there is a file size approximation in KB. Use google to figure the long KB number translated to MB. 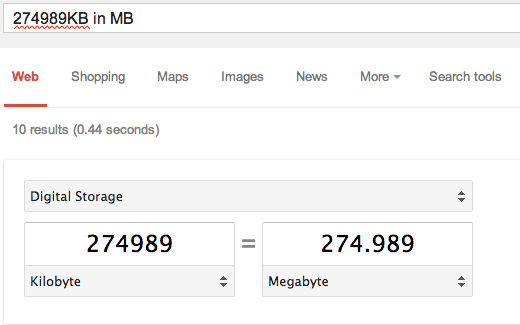 For example you can enter into a google search "274989KB in MB" and it will tell you the conversion - in this case the file is a little more than 2x too big. The idea is to get as close to your given limit as possible, as that will make the video file of the highest quality working with the file size constraints. The compression may take several hours. Then you can upload the .MP4 to your online grant application! Happy grant writing and receiving! Want more of these tips? Sign up for our Monthly E-Bulletin! Do you operate on a Mac? Do you follow Apple's regular updates? If so, you've updated your operating system to OS X Mavericks. For better or worse, Apple is constantly updating software and hardware and it can be confusing to keep up with compatability if you're not constantly buying Apple's newest products. With Apple's latest OS X Mavericks comes Quicktime 10.3 (automatic update). Unfortunately Quicktime 10.3 has several downsides for the DYI video folks. One thing to note specifically (especially LRRP clients that have quicktime .mov files in their performance video archives) is that one cannot open and play some .mov files without Quicktime "converting" the file - DO NOT CONVERT YOUR VIDEO FILES WITH Quicktime 10.3! Instead, everyone, please download free software called VLC. Use this as the default for playing/viewing video files (directions for changing default below). Further Questions about this? Ideas? Feel free to ask/share! Video Tip: Plan to gather your archives as you go ...and then back it up! Have you ever had a videographer document your show or event to then never get your hands on the actual document or even see it? Or do you only have the video in DVD format? Or is it solely online? For performance, it is essential to have a high quality video archive of your work. Don't leave it for later. What do you need for the basics? Make a point to plan with your videographers BEFORE the documentation of your event, to get a copy of the highest resolution video footage in .mov or .mp4 format. It's important to get the highest quality version of the video so you or an editor can put together your work samples, promotional videos and portfolio edits. 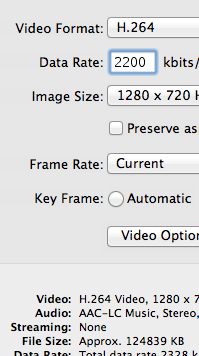 Editing with and exporting web resolution video or video ripped from a DVD will look very poor quality. Put the footage on your external drive and then back it all up to another separate external hard drive. There should always be at least two versions of ALL your material. Seriously. If one drive fails and you only have one copy (and your video peeps don't have a copy), it's gone. The end. Back it up! LRP gives EVERY client a copy of all raw footage in high resolution .mp4 format as well as, when applicable, edited material and upload-able video files compressed to look good on the web. Feel free to email us if have questions or ideas regarding file transfer and format logistics! Video Tip: Make the most of your Online Videos! 1. Embed your videos into your Website! This seems like a secondary task after uploading a video online, however, adding tags to each video will improve the search engine optimization significantly so that if somebody searches for you/the work, it will be one of the first links in the search engine list. As a test, search your name/company and one piece of yours on google and see how long it takes to "search" for a video sample of the work. **Some good tags to use are your name, your company name, your city, the title of the work, "dance" or "theater" or "performance", names of performers and collaborators, name of the venue, etc. These are basic practices that should be applied each time you upload a new video to add to your online portfolio of work. Questions? Ideas? Feel free to share! 1. Clear and Professional Title/Description - make sure, if you haven't already, to add simple text to the description box in the settings of your vimeo or youtube with location, date, and basic credits. Make a really clear and simple title like the name of the work and "excerpts" and possibly the year. Keep it professional. 2. Spice up your Profile - add an eye-catching image to your vimeo or youtube profile to avoid the missing person thumbnail that shows up right under the video. Make sure the name shows up as your actual individual or company name vs. an old hotmail nickname like "luvloren2". Keep it professional. 3. Send the HD Version *this one's a goody! * - vimeo links automatically play in hd if the uploaded video is such. However, you'll need to add &hd=1 to the end of your youtube links for the playback to happen in its highest resolution!!! I can't stress enough the difference between 360p and 720p playback of a youtube video. If you invested in high quality video documentation, this little step will help you make the most of your investment! Take a breath, know you did your best and blow a kiss! Ideally, you have a digital archive of high resolution video files of all your past work on an external hard drive and then backed up in a second location. However, most of us have a pile of DVDs of years of performance documentation in varying degrees of quality. And sometimes it's simply impossible to go back and get a high res version from the videographer. So, at least you have the DVD! Directions (after installing software): 1. File - Open DVD (select your DVD) 2. File - Export to Quicktime (unless you know what you're doing, don't mess with the settings) *I encourage you to include "rippedfromDVD" in the file name so you know the file's origin and save in an organized place on an external hard drive specifically for performance documentation archiving 3. Let the program run! Now, even beautiful high quality documentation originally shot in HD is highly compressed and downgraded to SD when put on an authored video DVD. When you rip from this already downgraded version, it's compressed and downgraded once again, thus getting your hands on original footage is ideal. However, if DVD ripping is the only option, this is your best bet! Feel free to contact us if you have problems, questions or ideas!